Ever in a rush to get the kids ready, and at the same time, get yourself done in the morning? With barely any time to throw something together to eat and get our day started, that happens to us all the time. 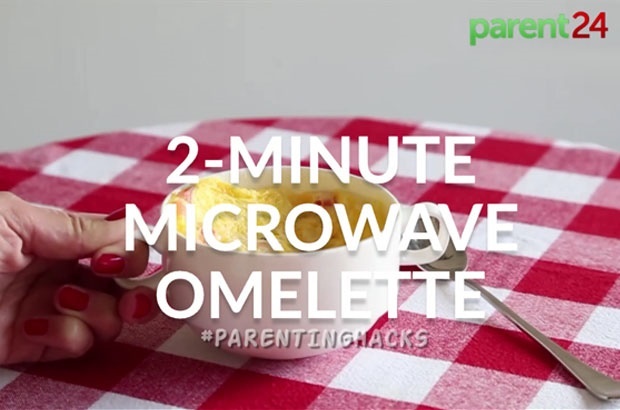 So we’ve put together a great 2-minute omelette that you can make from start to finish in the microwave. Check out the video and the ingredients, tips and tricks below. Cooking time will vary according to the power of your microwave, as well as the amount of eggs you use. After cooking, your cup, mug or bowl will be piping hot. Don't forget to wear oven mitts and let it cool for a few minutes. You can. Of course, vary the savoury ingredients used in the egg mixture, according to whatever you’ve got at home. Leftovers make for a delicious omelette! Which other videos and tutorials would you like to see on Parent24? Tell us by commenting below.